Two words. Chicken. Parm. Those might be the best two words in the English Dictionary. Seriously. 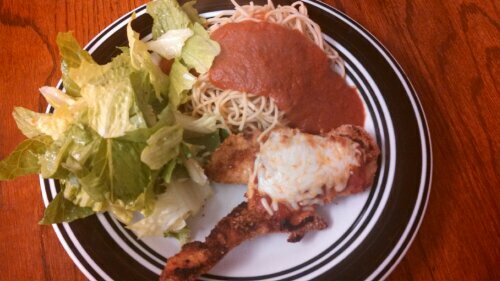 I think some of my favourite dishes are chicken parmesan, buffalo chicken, in any and all of their wonderful glories. My favourite restaurant to order chicken parmesan is at Ralph’s Tavern in Albany, NY. I am planning two trips to Albany next year (weddings galore!) and I may have to go eat at Ralph’s both times. Seriously, it’s delicious. 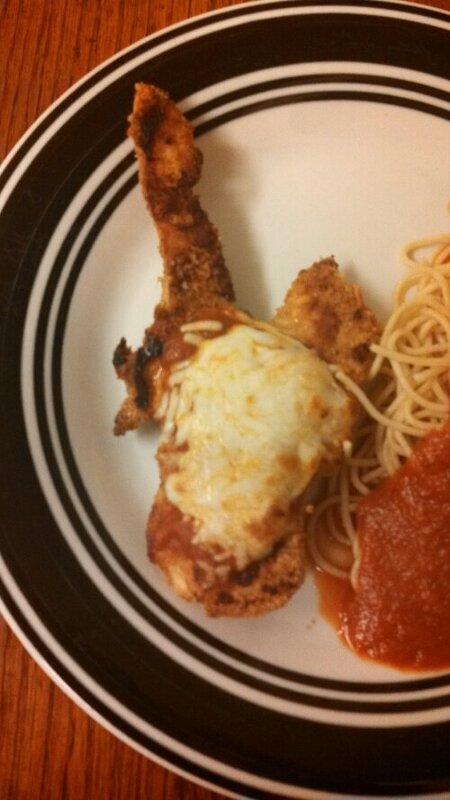 I call this – guitar chicken parm! I must admit that I totally missed the direction of brushing the chicken with butter prior to pressing into the bread crumbs…oops. I didn’t miss it, but I am sure it would be been even better with it! I realize this post is pretty short, sweet, and to the point – but what else is there to say? Round up the ingredients and make it tonight! PS – Be on the lookout soon for a chicken parm heroes (aka sandwiches) recipe!! -Preheat oven to 450 degrees. Spray a cookie sheet with cooking spray; set aside. -In a large pot of boiling water, cook pasta according to package instructions; drain well. -In a small bowl, combine breadcrumbs and Parmesan. Brush melted butter on each chicken breast, then dredge in the bread crumbs, pressing to coat well. -Place onto prepared baking sheet and bake for 20 minutes. Gently flip and bake until the crust is golden and the chicken is completely cooked through, about 5 minutes more. 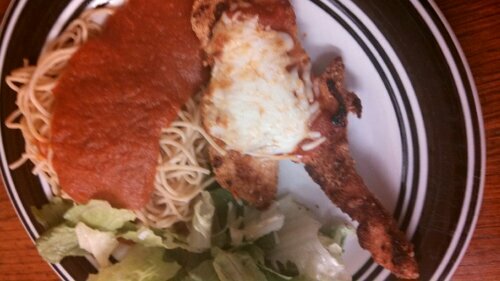 -Remove from oven; spoon 1-2 tablespoons marinara on each chicken breast and sprinkle with 1-2 tablespoons mozzarella. Place into oven and bake until cheese has melted, about 5 minutes. -Serve immediately with spaghetti and additional marinara.